With our hearts excited and pep in our step, all the students woke up energized and refreshed for their full first day in Johannesburg. After a mighty breakfast, we set off to the Kusile Coal Power Plant about two hours away from the city. Our travels across the highways are interesting in themselves, as we compare the lasting effects of apartheid and observe how immediately the urbanized city ends, where the townships begin, and when the farms and pastures take over. And with that regard, we were all excited to feel at home seeing fields and fields of corn and soybean! But in no time at all, we arrived to the Kusile Power Plant. As we approached the gates everyone’s eyes widened and mouths dropped at the magnitude and sheer scale of this engineering feat. The owner of the project is Eskom (the local power company) and has hired Alstom to construct the R300 billion plant (roughly $18 billion). Within the midst of the construction phase, Alstom backed out their power sector and sold it to General Electric (GE) to complete the project. Since apartheid has been abolished, South Africa has been having trouble in its energy sector trying to produce electricity for the citizens. It is fairly common for sporadic blackouts to occur, forcing individuals and businesses to rely on backup generators. 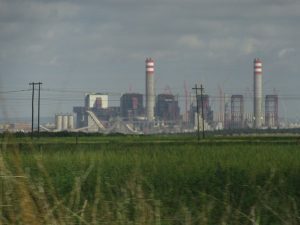 Kusile is the second coal power plant to emerge in South Africa, behind Medupi. What do they have in common? Both are extremely over budget and have increasing delays in their schedule. 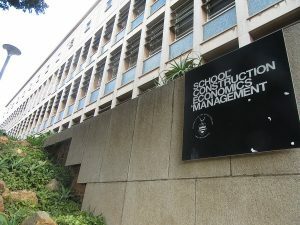 In South African construction, on average, 30% of the budget is reliant on labor and 70% on materials. Which, as you can see, the labor is extremely cheap, with companies paying roughly 180-250 rand per person (that is about $12-$15 a day). In effect, it provides little motivation for workers to move at a hastened pace. Contractors also try to avoid training laborers qualified tradesman skills because, afterwards, trained laborers can easily leave for the cities for higher paying jobs. As a result, most of the skilled labor comes from an abroad subcontractor, but not all. With regards to the procedure, we were able to slightly dip our feet into how the power plant functioned. First, the coal is delivered by rail from a nearby coal mine in South Africa. The coal is loaded onto conveyor belts and sent to be crushed to the size of 10mm. This results in a larger surface area of the coal, allowing a more efficient ignition. The coal is then sent to several boilers where they are ignited and heat a coil of flowing water within the system. After burning, the resultant fly ash from the coal is stored within silos and sold to concrete manufacturers. Due to the high heat, the water is then converted to highly pressurized steam where the energy is used to run the massive turbines and produce electrical energy. That electrical energy is sent to the transmission yard, followed by the grid, and distributed accordingly throughout South Africa. The steam produced in the process is later condensed, sent to a water filtration facility, and reused again. Quality work is of the most importance for the construction of the Kusile Power Plant. With every major component in the system, there is always a back-up plan in the event of a failure. Whenever the plant is powered on and off, it is done so in stages to make sure every individual component is running efficiently and won’t damage the rest of the plant. Also, every structural steel member is “stamped” with the number, designer, and erector to reference records in the future with regards to maintenance or failure. Details and RFIs were so concise, it required the contractor to replace and import the correct bolts three times. This process may seem large, but this system is only one of six replicas that the site is shooting for to build. Over sixteen million man hours have already been invested into the project to date. They started design in 2006 and broke ground in 2008. The project was estimated to be already complete, but due to shift in authority and unreliable labor, the schedule as continuously been pushing for a later completion date. With much trust in the managerial system and optimism, the new projected completion date for all six units is to be in 2021. Currently, 15,000 people are employed on the construction site. But, with the implementation of very strong computers and electrical systems, General Electric hopes to hand over the final product requiring only 30 Eskom employees to run the plant! The country in South Africa has seen many difficulties in managing the construction and the possible cost ineffectiveness of the project. In return, South Africans have been discussing new modes of energy including solar and wind power. With our wild hairstyles every morning, we can definitely agree South Africa has a high abundance in wind energy. At the end of the site tour, we continued to pose an array of curious questions on how things worked and how they were constructed. But alas, our schedule had required us to leave for our next visit. As with most trips, we all fell asleep with food in our bellies and from long walk in the sun. 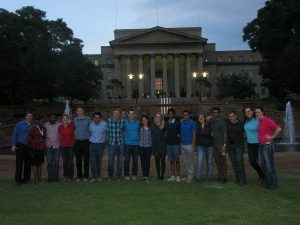 Our next destination included a visit to the University of the Witwatersrand in Johannesburg. We had the wonderful opportunity for Yomi to introduce us to a fellow colleague named Dave Root and several Masters and PhD students. We were able to dive into a few presentation about what construction looks like in South Africa and why the effects are what they are. Anine Wortman also presented her thesis on Waste Management and how waste can be reduced and controlled through the implementation of waste regulation process throughout the construction process. It was also wonderful to meet a fellow American working at Bechtel, stationed in South Africa to promote business development and start a new sector of the Bechtel company. He shared his personal views on cultural differences within several countries and their impact on construction. As the sun was setting, the students provided a magnificent tour of their “homes” on campus in the Civil, Architectural, and Research Buildings. The effect of the “Fees Must Fall” protests were still apparent, as we saw several boarded-up windows from vandalism and riot policemen with shields standing watch at the Great Hall. But, it was a joy to compare our school systems and the resources the university provided. 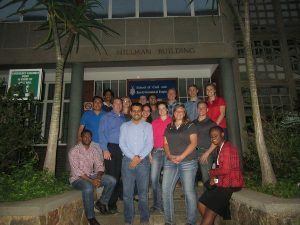 From our discussions, Witwatersand University appeared to have a strict and regimented program, with a 3+1 structure, and a graduation rate of roughly 50%. Most students require more than 4 years to complete their degrees. The faculty trains and pushes their students hard to make sure that only the best and brightest engineers are sent into industry. Within the tour we were able to visit the hydrology, concrete, structural, and water treatment labs. But of the most beautiful was located at the top of the building where we observed their research in green roofs and fourth-year student projects analyzing the effects of weather and erosion on compression loaded domed structures. It was a complete pleasure to meet the young and bright students and we hope to see them someday in America. With much gratitude we returned to the comfort of the Balalaika Hotel. But wait! Before we did so, we had to make sure we stopped at one of the largest food franchises in the world, McDonald’s! We needed to see and taste the variation of culinary expertise and exotic flavors of the Big Mac and Quarter Pounder, South African style. Successfully we were able to check our bucket lists for our worldwide travels in wining and dining.